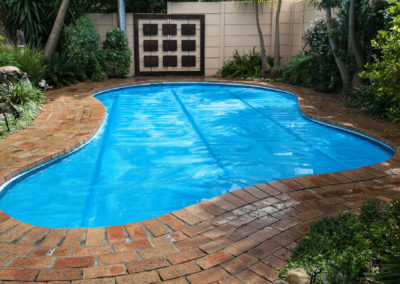 In the South African climate, swimming pool owners are only able to make use of their swimming pools for a limited number of months during the year. 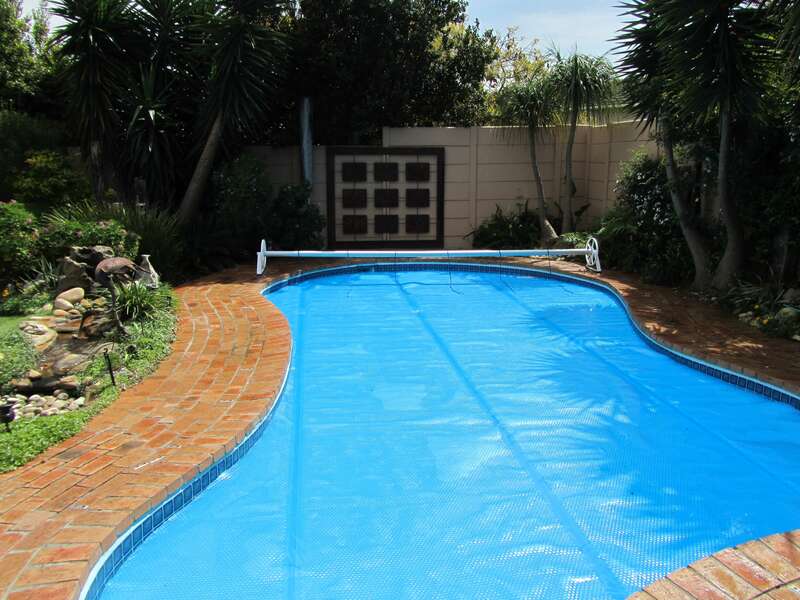 Water loss is of major concern with an average uncovered pool losing over 3000 litres of water a month. The Solar blanket is an excellent product introduced to extend the swimming season and to reduce evaporation by as much as 95%. Quality of material is key with a solar cover and the Aqua-bubble and Ultra Dome are just that, quality products backed by industry leading warrantees. Water evaporation is eliminated when a solar blanket is in place on a pool. 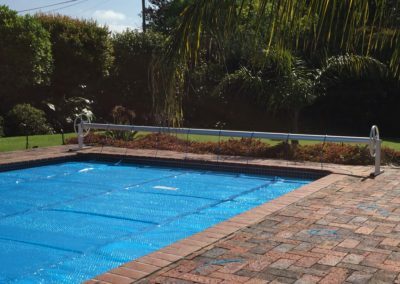 As water is fast becoming an expensive and scarce resource the solar blanket offers the ecologically conscious pool owner a means to reduce water usage, chemical usage and electricity. The cost incurred purchasing a solar cover is recouped as result of water savings over the 7 year lifetime of the Ultra Dome. 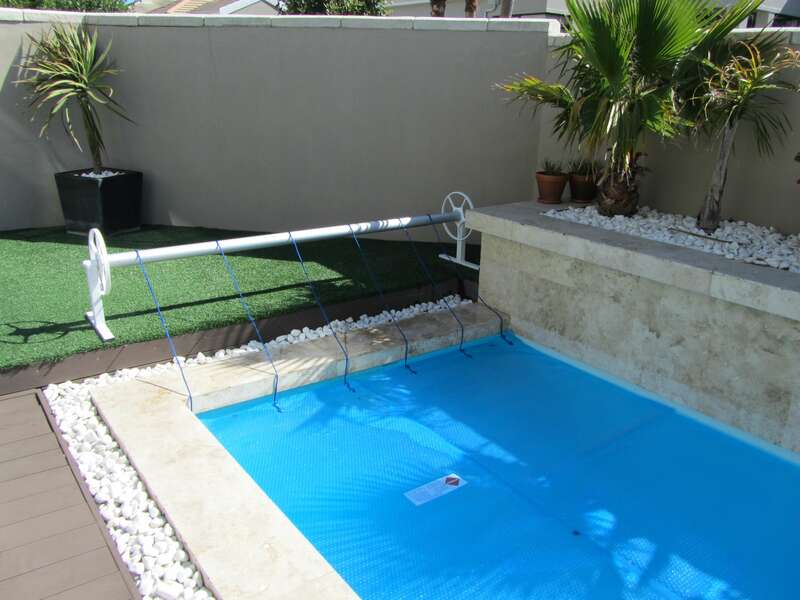 In the South African climate, swimming pool owners are only able to make use of their swimming pools for a limited number of months during the year. 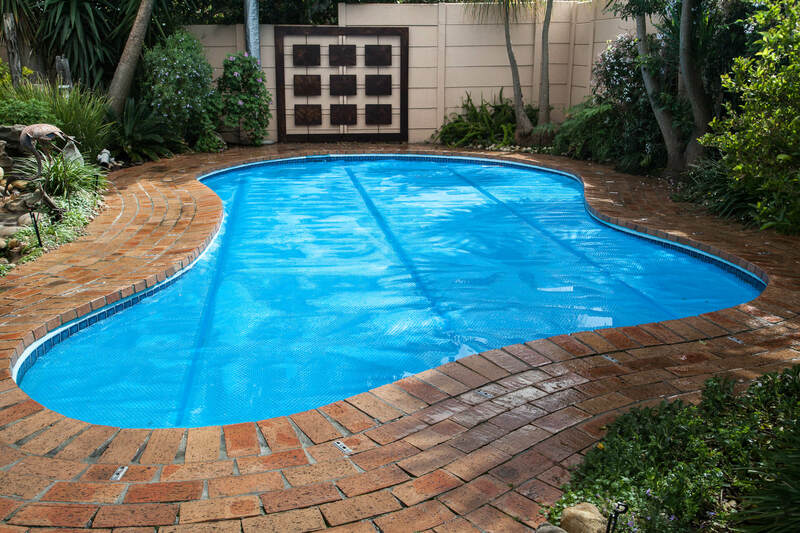 Water loss is of major concern with an average uncovered pool losing over 4000 liters of water a month. The Solar blanket is an excellent product introduced to extend the swimming season and to reduce evaporation by as much as 98%. 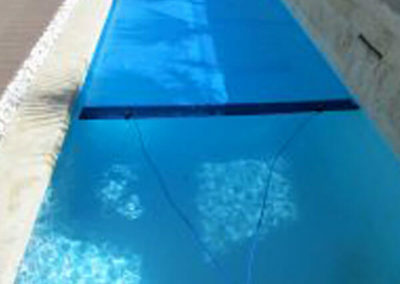 Each of the above product variants is able to provide excellent heating benefits, raising the temperature of the pool water between 5 and 10 degrees Celsius. The solar blanket has two primary functions. 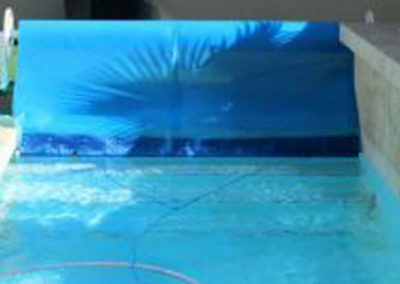 Firstly UV light passing through the material warms the pool water directly below the cover. Through circulation of the water by means of the pool filter system the warm water is circulated throughout the pool, raising the overall temperature of the pool. The second function of the solar blanket is as an insulator. During the cool evenings or when it is windy, the solar blanket insulates the pool, preventing heat loss. It is possible to maintain a relatively constant water temperature over an extended time period. The swimming season can be started one to two months earlier than usual and can be continued one to two months later than usual. 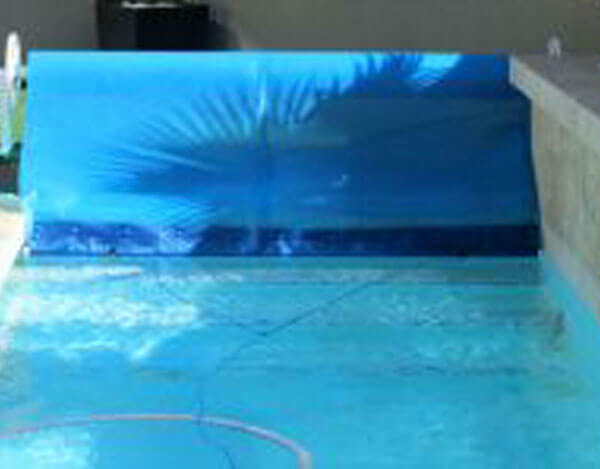 The solar blanket on its own is a very effective pool_water heating system. It is wise to first purchase a solar blanket and establish if sufficient heating benefits are achieved before spending more money on an entire solar heating system consisting of a heat pump or roof panels. Both of these water heating methods would need to be supplemented with a solar cover in order to minimize heat loss, evaporation and electricity usage. 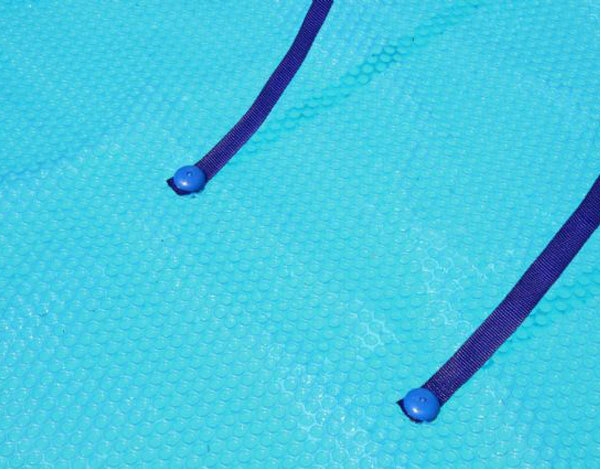 Water evaporation is eliminated when a solar blanket is in place on a pool. 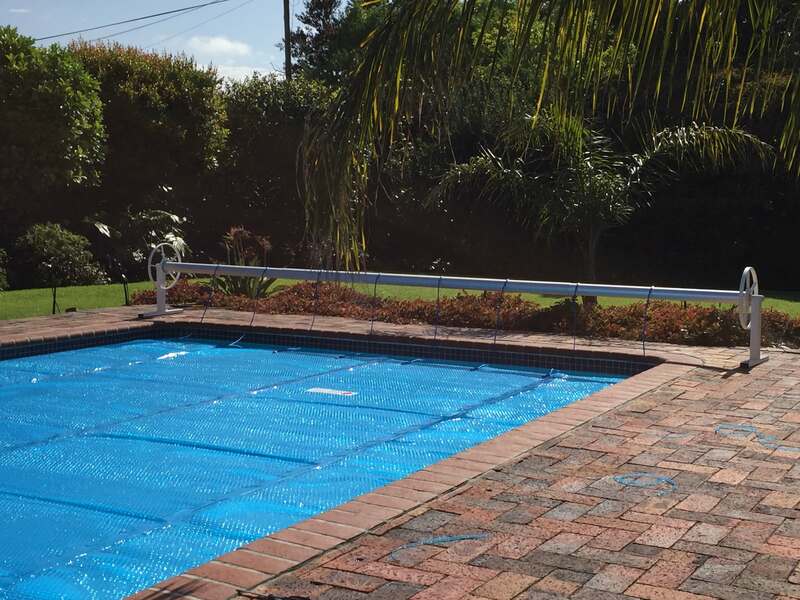 As water is fast becoming an expensive and scarce resource, the solar blanket offers the ecologically conscious pool owner means to reduce water usage, chemical usage and electricity. The cost incurred purchasing a solar cover is recouped as result of water savings over the lifetime of the blanket. This is particularly true where the Ultra Dome is fitted due to its excellent 7 year lifespan. The different cover variants are all equally capable of achieving the desired heating benefits as a result of sun exposure and also reducing maintenance and running costs. The main difference between the 2 product variants relates to the lifespan of the material. The Ultra Dome lasts almost double that of the 500_micron Aqua-Bubble. The Ultra Dome material is constructed using a rounded bubble shape and maximum wall thickness of the bubble is achieved in the base of the bubble where the bubble has most water contact. The bubble shape of the Ultra Dome does not allow for any weakness as corners are not evident in the bubble construction and as such the Ultra Dome is able to last a minimum lifespan of 7 years. The Solar blankets’ lifespan is determined by variations in the material thickness and construction of the bubbles of the blanket. Shortcomings with regards to expected lifespan are generally attributable to usage and care factors. 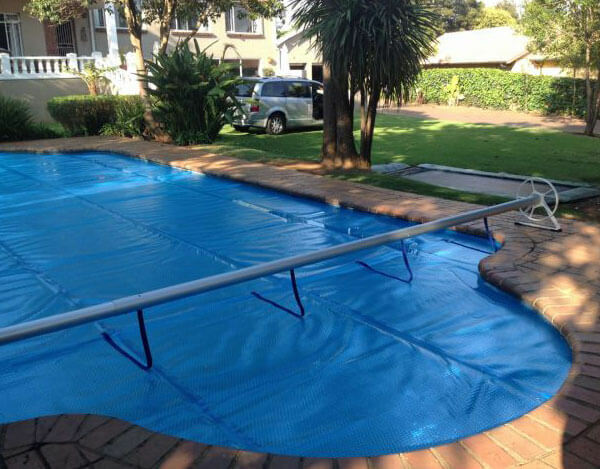 Excessive exposure to unbalanced water or concentrated chlorine levels or exposure to the sun when off the pool, are the main contributing factors to pool cover failure. 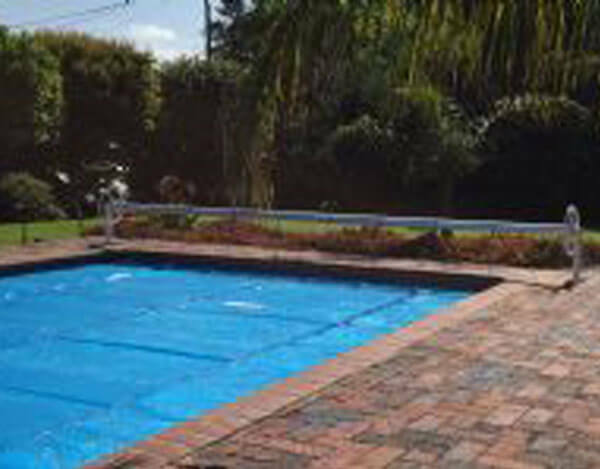 The solar blanket lives in a very harsh environment with UV (Ultra Violet) light and pool chemicals such as chlorine acting upon it. The chlorine in the water is constantly attacking the material, the UV rays produced by the sun degrade the blanket and heat will also play a part in accelerating the effects of chlorine and UV. 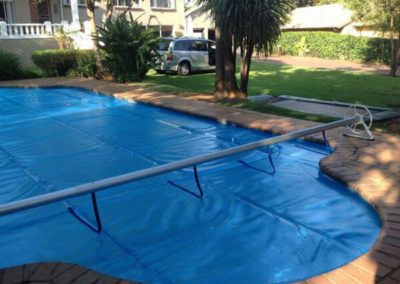 The main contributing factor to the premature failing of a solar blanket is due to incorrect chlorine levels in a pool. This is especially true where chlorinators are in use and the chlorine levels are not being monitored correctly a with the result that chlorine levels concentrate over a period of time. It is also important to note that when a blanket is in placed on a pool, the pool water will heat up. This warm environment is ideal for algae growth. It is very important to ensure that chlorine levels in the pool are stable to ensure that the pool does not start to turn green. A solar blanket cannot cause a pool to go green. Lack of chlorine results in algae growth and a green pool. The towing kit allows the solar blanket to be fitted and removed easily. It offers additional reinforcing to the solar blanket. Install the blanket on the pool, bubble side down. 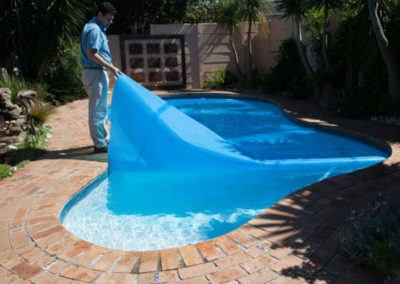 Before trimming, ideally the blanket should be left on the pool for a few hours to allow wrinkles and folds to flatten out. Lay the cover bubble side touching the water. Flatten out the cover using a pool brush, so that the cover lies relatively flat on the water. Using the pool as a template, take a pair of ordinary household scissors ( the sharper the better) and with someone holding the cover in position, cut the edge of the cover so that it sits flat on the water with 50 – 75mm rising up the side of the pool. Cut the cover a second time trimming off the excess 50 – 75mm, so the cover is now flush against the edges of the pool and lies flat on the water. It may be necessary to trim the cover again after 2 – 3 weeks, once the cover has settled. Do not over trim the cover exposing large areas of water surface. This will make the cover more prone to the wind blowing it off the pool. Do not leave exposed flaps of material up the sides of the pool edge. This will also make the cover more prone to the wind blowing it off the pool. The blanket should fit snugly to the pool sidewall. To avoid trimming the blanket too small, the first cut should leave the blanket slightly larger than the water surface area, then make the final trim. It may be necessary following the initial cutting to trim the blanket again a few days later. This is required if the blanket was not entirely flat when first fitted. Following continued sun exposure the material will flatten and lie on the water better. It will never be possible for a blanket to lie completely flat on the water surface, due to air pockets being present and due to folds or joins in the material. The blanket should not overlap the sidewall, which could result in an opening for the wind to get under the blanket. A properly fitted blanket will be held in place by surface adhesion, requiring no tie downs during windy periods and heavy rain. Having stated the above, it is possible if the paving has a sufficient overhang, to cut the blanket leaving a small “flap-up” the pool wall that “locks” in place beneath the paving overhang. This installation type will prevent debris from filtering down the sides of the blanket. A cut out and flap extending into the weir will allow for debris to be hosed directly into the weir. NOTE: The flap up installation is NOT standard installation procedure as it is more difficult to fit and remove the cover without abrasion to the cover. Avoid laying the blanket out on the lawn for any reason. The sun’s rays passing through the bubbles will cause damage to the grass. 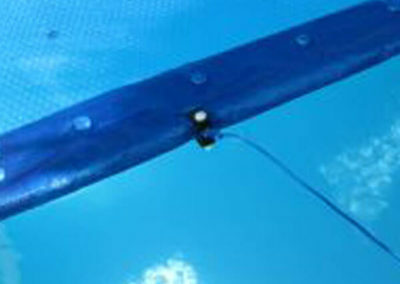 By using the “fanfold” technique, two people can easily remove the blanket from the pool in minutes. Simply pull 1.25 meter at a time over one end of the pool and continuously fanfold the blanket “accordion fashion” until the entire blanket is stacked on the paving. 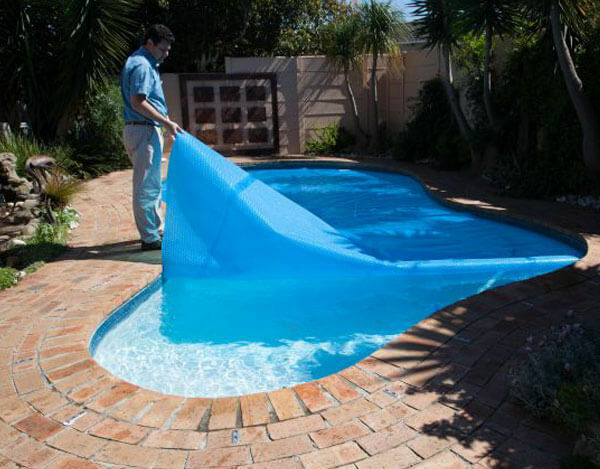 The blanket can then easily be pulled back onto the pool in seconds. 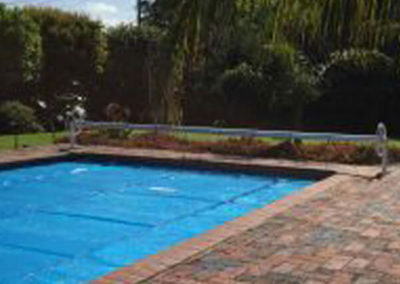 Solar blanket rollers are best used on rectangular shaped pools. Free form pool shapes are not recommended for a solar roller. Please discuss the potential for roller usage with an Aqua-Net sales person. 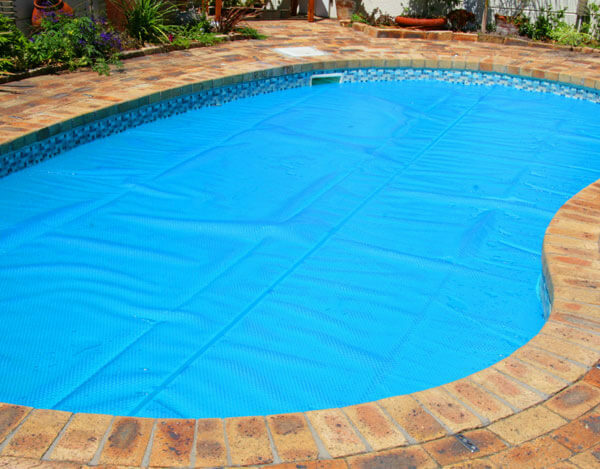 Always cover the blanket completely with its protective cover sheet when it is not on the pool. Never leave the blanket out in direct sunlight whilst folded or wound onto the roller. The heat generated by the sun will be magnified many times, thus heating the trapped water in the blanket to extreme temperatures, which in turn causes delaminating of the blanket material. This is caused by bubbles expanding and forcing apart the laminated areas, causing the bubbles to burst. This results in white patches of delaminated material where pockets of air between the layers is apparent. 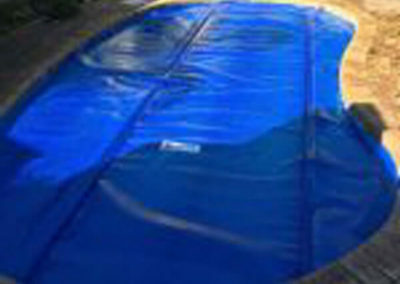 For many years the pool cover industry has experienced bubble deflation in a very small number of covers. Tests carried out have confirmed this problem is linked to the build up of combined chlorine, and the accumulation of nitrogen tri-chloride gas directly under the cover. The most common sanitizer used in swimming pools is chlorine. When added to pool water, chlorine carries out two main functions, primarily it destroys micro-organisms but it also acts as an oxidizer, destroying organic contaminates. One result of these chemical processes is to convert the active free chlorine into chloramines and other chlorine compounds. It is recognised within the pool industry that free chlorine levels of between 1 and 3 ppm along with combined chlorine levels kept well below 0.2ppm are the ideal conditions for well balanced and healthy pool water. However, if this ratio is allowed to reverse, and the combined chlorine level climbs above the level of free chlorine, then nitrogen tri-chloride gas is produced. This is the cause of that familiar chlorine smell, along with irritation to the eyes of pool users. When this problem occurs it is important to bring the pool water back to an acceptable level of chlorination, either by shock dosing and burning out the high levels of combined chlorine, or carrying out a partial water change. If nitrogen tri-chloride gas is allowed to build up under the bubble cover, air will diffuse out of the bubbles, causing them to deflate. Once the bubbles have collapsed it is not possible to reverse the process and a new cover will be required. 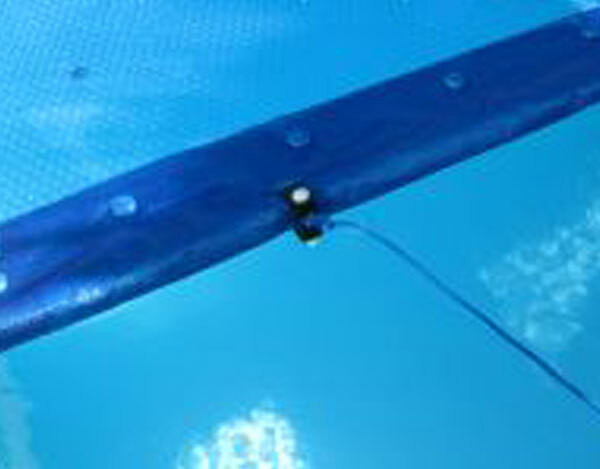 If a solar blanket is damaged as a result of exposure to the above, it is best to first correct the water chemistry before a replacement cover is introduced onto the pool water surface area. A clean, highly transmissive solar blanket is more efficient than a darker, dirtier one. A clean blanket will allow more of the sun’s rays to pass through the blanket to heat your pool water at all depths. Use mild soapy water and a soft brush to clean the solar blanket. This becomes especially necessary when there is salt build up on the cover with salt water pools. Debris and dust can be hosed directly into the pool skimmer box/weir. Before storing the blanket, clean it and allow it to dry thoroughly to prevent mildew. Fold it only on the seams and roll it from one end. If possible it is best to simply roll the blanket up without folding it. Place the blanket in a clean, dry, rodent-free area where temperatures will not reach 40 degrees Celsius. Exposure to the sun, water and pool chemicals during normal usage will eventually destroy the solar blanket. The time this takes to happen is dependent on the usage and care given to the solar blanket. 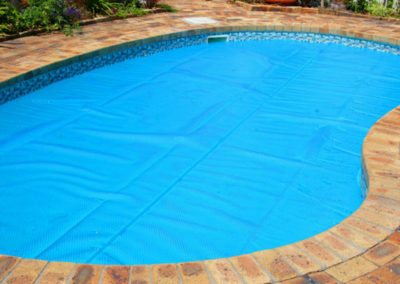 When bubble disintegration, delaminating, flaking or peeling occurs, remove the blanket from the pool and replace it with a new solar blanket. 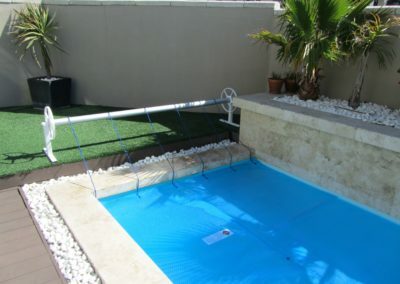 If the pool cover has not achieved it’s expected life, then it almost certainly has been subject to excessive chlorine levels / unbalanced water and / or excessive exposure – either intermittently or continuously. The amount of UV rays produced by the sun and the exposure of the blanket to these rays on and off the pool. The volume of pool chemicals (such as chlorine) in the pool water. The chemistry parameters that balance the pool water (pH) Potents Hydrogens, (CH) Calcium Hardness,(TA) Total Alkanility. The heat of the pool water (whilst the cover is on the pool). Ensure the pool water is balance. Ideal 7.4 range: 7.2 to 7.6 If the pH is too low the water becomes very corrosive If the pH is too high scaling will occur. Ideal 275 range: 150 – 400ppm. If the CH is too low the water becomes corrosive. If the CH is too high scaling will occur. Free chlorine (FC) – amount of chlorine in water to sanitise / disinfect water. Ideal range – 1 to 3ppm (3 parts chlorine to 1 million parts of water which is 3ml. per litre). Total chlorine (TC) – total of chlorine in water = free + combined. Combined chlorine (CC) – undesirable, bad smelling, irritating compounds which form. when not enough free chlorine is available CC = TC – FC. The combined chlorine value should never exceed 50% of the free chlorine value. Ideally as close to zero as possible – not exceed 0.2ppm. water treatment supplier for further information. NB: It is important to note that Salt Chlorinators generate chlorine gas through a process of electrolysis. If chlorinator settings are not adjusted to take into account seasonal changes and fluctuations in ambient temperature, either excess chlorine is introduced into the pool and this dramatically affects the lifespan of the blanket or insufficient chlorine is produced resulting in algae growth and green unhealthy water. Further to this, a chlorinator produces chlorine wether required or not. 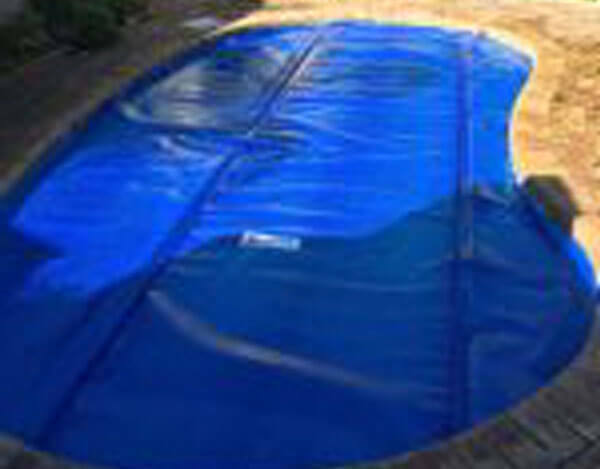 When the solar cover is in place, excessive chlorine build up can occur, resulting in damage to the blanket. Careful monitoring of the pool water is required to ensure that correct life spans are attained. 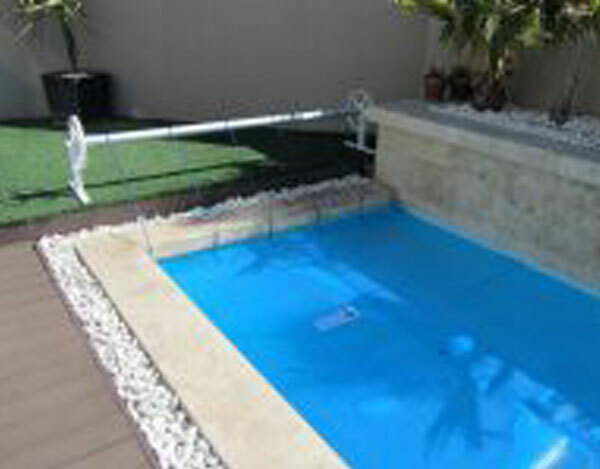 If a pool is “shock dosed”, remove the pool cover and replace only when the chlorine level is back to normal. Damage caused by excessive chemical exposure is excluded from the warranty.